We have an incredible assortment of pins at PAX Prime this year! Here’s the list for all you Pin Pals. First up we have this year’s Prime set. This includes 80’s Gabe and Tycho, Seattle Thomas and the PAX 14 logo. This set will be available at the PA merch booth. 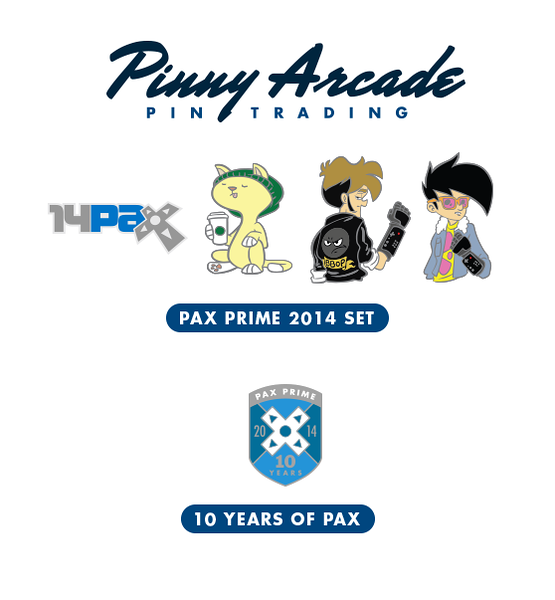 You will also be able to get the exclusive PAX Prime -10 Years Of PAX pin there. These 10 year anniversary pins are limited and we will release a number of them each morning at the merch booth. 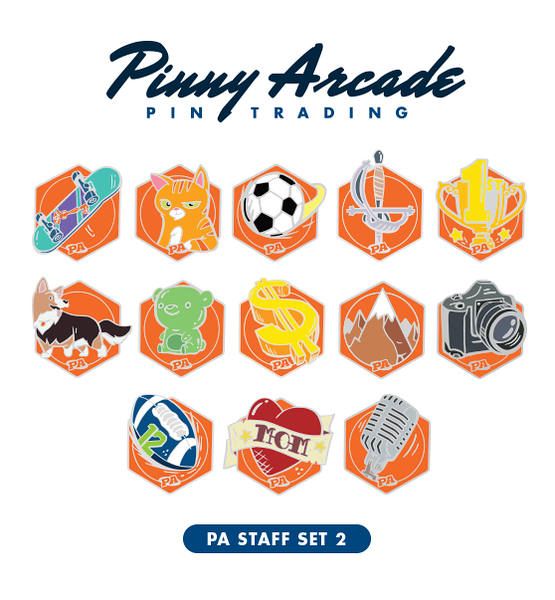 Next up are the new PA Staff pins. Each of the folks here in the office will have their own pin this year reflecting their hobby/unhealthy obsession. Find Jamie to get her Corgi pin, Robert for his money pin, or Jeff for his football pin. Try and find everyone to collect them all! Finally we have this year’s partner pins. All of these pins will be available at their respective booths except for two. The incredible Tiamat pin will be given out only to attendees of the Acquisitions Inc. panel and the Pat rothfuss pin (get your pipes!) will be at the Geek Chic booth. There’s some really cool stuff this year as you can see. If you managed to get the Garruk pin at East you can get the dark side now at Prime. These two pins go together to make his full face. Blizzard is offering up the Elite Tauren Chieftain pin as well as the Iron Horde symbol. We Love Fine has an awesome assortment of Adventure Time pins. At the Microsoft booth you can get Sunset Overdrive and Age of Empires pins. Sony has the Tearaway pin as well as the symbol from the super cool looking Order 1886. Ubisoft has their Next Level pin and Supergiant has a beautiful Red pin from Transistor. Head over to Klei to snag the Don’t Starve pin or Spry Fox to get the adorable bear from Triple Town. Behemoth will pack their Chonka Chonka machines with new pins. Undead Labs just announced their new monster hunting game Moonrise and you can capture the first monster in pin form at their booth. Kris Straub, katie Rice, Scott Kurtz and Loading Ready Run will also all have new pins at their booths over in Bandland. As always Tycho and I will have our pins on us as well. There will be lots of opportunities to trade with us and the other folks here at PA. Keep an eye on our Twitter feeds during the show. Good luck to all the Pin Pals out there, This is going to be an incredible PAX for trading!